Five years ago, I bought a few buildings west of Bathurst on King Street; 780, 782, 786 King Street West. I was really just looking to own our offices for Brad J. Lamb Realty, Lamb Development Corp., and any other real estate related enterprises I was into. We ended up renovating 786 King Street West for our new headquarters; 12,000SF on 4 levels. I leased the other two buildings. At the time, I thought we would never outgrow the space. I had 16 sales representatives, 2 mortgage brokers, and a management and administrator staff of 7. We had the space to expand to 23 sales reps and 12 management/administrators. I didn’t think in 2008 that we would need more. Frankly, we raised the design bar for real estate brokerages with our 786 King Street West address. Well, it’s 2013 now and we have expanded to 23 sales reps and 15 management/administrators. We have no room left in our current location. I realized that for Brad J. Lamb Realty to grow and be what I want it to be, we needed a true retail style operation with the capacity to grow to 50 sales representatives in the style and format that I had offered in the past. Lamb Development Corp. also expanded, so now we have had to move. I wanted to stay on the best street in Toronto for marketing and selling real estate. That is King Street West. It is the epicentre of condo Toronto. 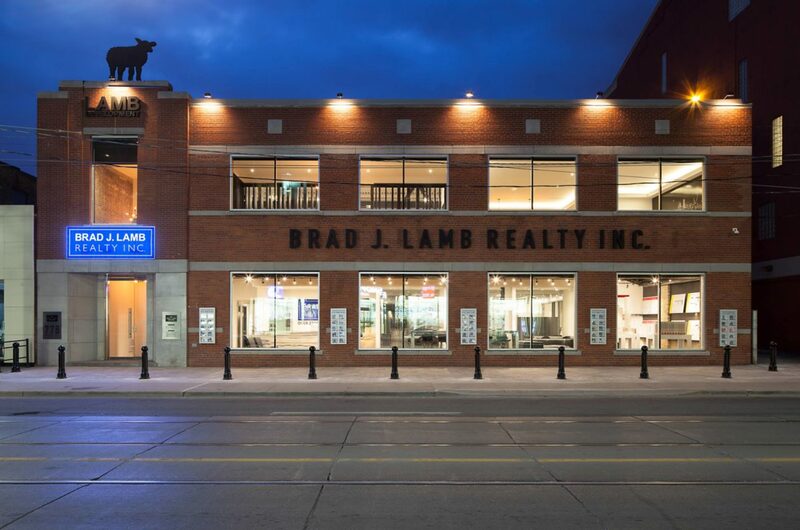 I wanted a big improvement in the customer experience and a true retail at grade environment for Brad J. Lamb Realty Inc., essentially a condominium store on what you may call Toronto’s downtown high street. I also wanted world-class headquarters for Lamb Development Corp. If we were going to be a world-class development company, then we needed an office to reflect that. So, I bought 778 King Street West, the former Uniforms Art Gallery, two doors east of my current location of 786 King Street West. The building is 16,000SF over two levels and it offers phenomenal efficiencies. We now will have the capacity for 50 sales reps and 30 management/administrators. We will have the kind of headquarters I could have only dreamed of 5 years ago. We have so many new exciting ideas that we will be incorporating into what will be offices for the brokerage Brad J. Lamb Realty Inc., the development company Lamb Development Corp., our mortgage lending facilitator King West Financial, and our real estate holding company Bel-Three Property Management Limited. Let me just say that our new real estate retail store at 778 will be the finest of its kind in Toronto. It features 8000SF of at-grade retail with a complimentary coffee/water bar, a lounge area for potential buyers and interested parties to have a pressure-free environment to search for real estate at two interactive work stations. We have also created a New Condo Store, where condo shoppers can peruse the latest offerings from Lamb Development Corp. Additionally, our new lobby/lounge area will host frequent events to allow for people from all walks of life to meet about art, science, commerce, technology, and real estate. Additionally, we have a fifty-person conference area where we will host free monthly first-time buyer seminars and condo/real estate investor seminars. I’m excited about Toronto’s future. I’m excited about Toronto’s condominium market place, I’m excited about our new office, and our place in Toronto’s future.